Not to be confused with Jerry Reese (defensive lineman). Jerry Reese (born July 22, 1963) is an American football executive and former player and coach. He is the current general manager of the New York Giants. 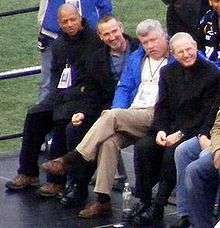 He succeeded Ernie Accorsi as general manager on January 16, 2007, having been with the Giants since 1994. Jerry Reese was inducted into the Tennessee Sports Hall of Fame in 2009. Reese is a native of Tiptonville, Tennessee, where he played for the Lake County Falcons' 1980 state champion 1-A high school football team. He then played for the University of Tennessee at Martin where he was later an assistant coach before taking a job as a scout for the New York Giants. From 2002 until becoming general manager in 2007, he was the Director of Pro Personnel for the Giants. Reese is credited with the Giants' success in the 2007 NFL Draft, which included the selections of Aaron Ross, Steve Smith, Jay Alford, Kevin Boss, Michael Johnson, Ahmad Bradshaw, and Zak DeOssie. Some of them played important roles in the Giants' Super Bowl XLII victory. Prior to the start of Giants mini-camp in May 2008, Reese and the Giants were invited by President George W. Bush to the White House to honor their victory. ↑ Hague, Jim. "Falcons end grid season on high note with win over Lodi", Aim Jefferson, November 19, 2010. Accessed March 29, 2012. "Freshman quarterback J.R. Reese finished with a flair. Reese completed all six of his passes Friday night for 75 yards and two touchdowns. The son of Giants general manager Jerry Reese has a very bright future with the Falcons and still has three years to fine tune his signal calling skills."